The County Ground at Northampton houses a pleasantly modest memorial garden. It contains a sundial, memorials to various worthies of the club (such as Ken Turner) and one to the Northamptonshire players who died during the two World Wars. It is surprising that it was erected as recently as 2014, but then it seems that the sense of loss for the war-dead increases rather than diminishes as time goes by, and as those who survived the wars, too, die away. Sydney Askham played 5 matches in 1914, Ryan 8 between 1911 and 1914 and Tomblin 2 in 1914. Askham, an all-rounder, had played for Wellingborough School and was killed, aged 19 at the Somme. Ryan, a regular soldier from Roade, also played 1 match for Ireland, and died at Loos in 1915, aged 23. Tomblin, from Brixworth, died a year later at the same age. S.C. Adams, “a County Council clerk” and leg-break bowler, took 6-32 on his debut against Dublin University in 1926 but did not play again until 1932, when he played a further 9 times, ending his first-class career with 13 wickets at an average of 17.54. A Gunner in the Royal Artillery, he was killed in Germany in May 1945. Michael Cassy played in wartime matches for Northamptonshire and Oxford University and died serving with the Grenadier Guards in Italy in 1944 without making his official first-class debut. E.J.H. Dixon had been an Oxford blue between 1937 and 1939. According to J.D. Coldham’s 1959 History of Northamptonshire cricket, he was “a Yorkshireman, his rock-like defence was an affliction to Cambridge and, as a cool and capable captain, he led Oxford to victory in his last year“. He played 8 games for Northants in 1939 and died on service with the R.N.V.R. in 1941, aged 25. Nelson really deserves the chapter to himself that Coldham gives him. A Cambridge blue and a master at Maidwell Hall preparatory school, he was offered the captaincy in 1938 when Northants were at a low ebb, having not won a match since 1935 (a feat they achieved in his second and last season in 1939). According to Coldham “he impressed everyone with his charming personality and by the stability, self-control and tolerance of a real leader of men. Only through reasons beyond the jurisdiction of cricketers was his reign so short“. A second-lieutenant in the Royal Marines, he was killed at Dover in October 1940. I say that Nelson deserves a chapter to himself, but, of course, they all do, even if not primarily as cricketers. All amateurs (though it’s possible Adams was giving it a go as a pro in 1932) they were typical of the men who played for the smaller Counties before the Second War, when clubs such as Northamptonshire had only a small number of professionals (as few as three in 1921) and the bulk of their sides were made up of playing members, more like a modern club side than a contemporary county. Schoolmasters, soldiers, students, clerks, they played, when they could escape from work, for the love of the game (if love is not too unambiguous a term for what motivates amateur cricketers). The sense of unfulfilled promise is there, of course, but their promise at cricket must have been a small part of the potential lives they lost. 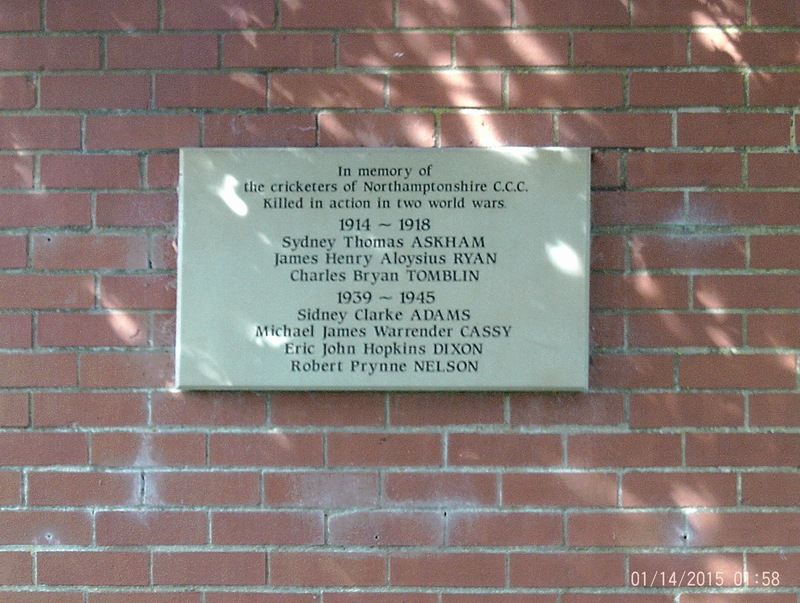 No doubt they have other memorials elsewhere, in their home villages and overseas, where they are commemorated in the context of their wider lives, but it is fitting, too, that they should be remembered in the place to which they had escaped to play cricket, by those who have managed to escape from work to watch it.